These desert camouflage waterproof jackets are made from breathable and waterproof material. 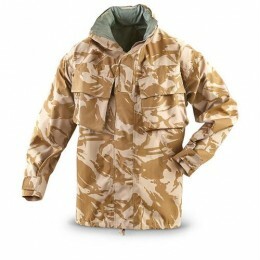 Originally supplied to all UK troops sent to Iraq or Afghanistan for 'winter' deployments. Storm hood which rolls up into the collar when not required. There are two bellow chest pockets with velcro closure flaps. Central rank slider on the chest for insignia.